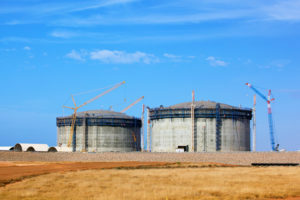 Tank Consulting is another service we offer for LNG and flat bottom tank construction and welding. Depending on your location in the world we can come to your job site or office and work with your team. Or send us drawings with your construction plan so we can work remotely to review and assist your company. We have experience working from the design stage of tanks to the completion of the construction in many areas and climates of the world. We have experience working with the design engineers on the constructibility of the design, schedule, man power, the selection and use of wide variety of large and small cranes, hoists, scaffolding, rigging, and most other equipment and tools involved in the construction and welding of tanks.